New York magazine recently featured various brands that have flourished in the past five years despite hard economic hard times. The individuals behind such companies as Tumblr, Chobani, and One King’s Lane discuss how they built their business.This graphic of Chobani founder Hamdi Ulukaya made me giggle. What I really want to know is how they decided on raspberry as the flavor? Is plain Greek yogurt just not exciting enough to bathe/drown in? Was blueberry too sad? Maybe blood orange would be too much? Or maybe he just likes raspberry and pink is pretty against his skin tone or something—I don’t know. I think I just think too much. Or maybe I’m just still recovering from sweating my brains out at Zumba this morning. 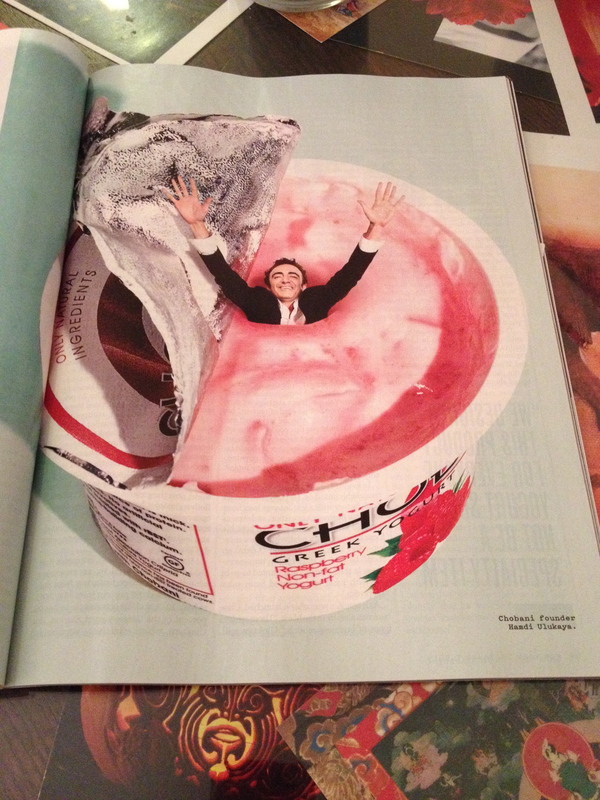 What flavor yogurt would you choose to be photographed partially submerged in? This entry was posted in Uncategorized and tagged Chobani, New York magazine, yogurt. Baha. That picture is ridiculous and I love it. I really like just plain greek yogurt, but if I had to pick a flavor I would go with raspberry.